After almost 5 years with 2 of my clients….Their family has abruptly left the company I work for. I have been robbed of my chance to say goodbye. In 2008 I first met the little guys. Since starting with them I have worked with them at least 4 days a week. 4 days a week for the past 4 1/2 years. I have gone to school with these boys every year. The family and I even joked about picking a local college for them to attend so that I could continue shadowing the boys. I spent more time with them than my own family. They became my little brothers. In fact, the whole family became like family to me. I grew close with the mom, and watched the siblings grow up over the past 4 1/2 years. I was told I was “part of the family”. I’ll skip all the details, but somewhere along the way…and I really don’t know where, things went sour last week. And in an instant, I went from “part of the family” to hardly more than a stranger; an enemy even. And in a moment, I was robbed of my chance to say goodbye to the little boys I love as if they were my own brothers. The finality of this relationship is a pill I’m not ready to swallow. But not having the chance to see them one more time, and let them know I won’t be seeing them anymore but how much I will miss them…. I don’t know if I’ll ever be able to swallow that. After almost 5 years together…. I have been so robbed. 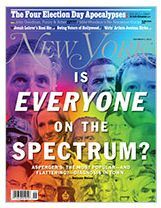 New York Magazine published a rather lengthy article recently about the overuse, and misuse, of Aspergers and Autism Spectrum diagnoses. You can read the full article here. The piece discussed how “aspergers” has become everyday language, “sloppy vernacular”, and is no longer true to it’s origins. It has morphed into a catch-all; everything from a slur to an identity. It’s a card quickly pulled to describe people who don’t fit into our own box. I notice the rampant overuse of “aspergers” and “on the spectrum” all the time. Some people are always on the lookout for odd people they can hastily label off the cuff. That kid doesn’t pick up on when people are annoyed by him? Aspergers! That person is obsessed with that thing? On the spectrum! It really bothers me when people throw out fake diagnoses like candy on Halloween. First- I can’t stand the overuse of diagnoses as slang because it completely overlooks a main criteria for diagnosis. In order to be diagnosed with something, the DSM-IV is clear that the symptoms must interfere with the person’s life in some way. Just because you have symptoms of something does not automatically give you a diagnosis!!! Your functioning MUST be inhibited by the symptoms in some significant way in order to warrant a diagnosis. So what if a kid is aversive to certain sounds? So what if he prefers things lined up or grouped by color? Who cares if he rocks back and forth a little? Unless those things prohibit him from forming relationships, learning, communicating, etc. it’s NOT diagnosable! All human beings have weird little things about them. Every single person on this planet. Instead of pathologizing every nuance, let’s be real and recognize all people have quirks. For me, I avoid touching jeans with my fingers. Wearing them is just fine…but I can’t stand how the fabric feels on my hands. And #2 pencils!! Oh my gosh. I strongly prefer mechanical pencils. I just hate the sound and feel of the lead from writing with #2 pencils. And my stims: I crack my bones constantly (even at the expense of husband’s sanity). My neck, back, fingers, wrist, ankles, and even toes. I have to crack them all dozens of times a day! I also play with my own hair when I’m upset. It soothes me. I light candles that smell good. I play my favorite songs on repeat sometimes. I shake my foot when I’m sitting. I do lots of little things that make me feel good. We ALL have oddities and self-stimulatory behaviors. That doesn’t mean we all have autism or aspergers! Which brings me to my next point…. Secondly, it upsets me that people diminish a true diagnosis, and all that goes along with it, by slapping a quick label on people. Not to sound all doom and gloom and rant about how miserable autism is…but it ain’t a walk in the park!! There is hardship and heartache and worry and fear and pain and a million other things that surround a diagnosis. Calling some quirky kid “clearly aspergers” or “totally on the spectrum” negates what autism really is. Yes, autism is on a spectrum and plenty of kids are considered ‘high functioning’ and face less day to day struggle than others. But there are plenty who genuinely suffer with autism. Again, not all experience autism the same. But, I just don’t believe autism is purely some wonderful, magical gift we should all happily embrace. Embrace the child and his or her strengths and personality and traits, of course! But discredit how gut-wrenching autism is for many families…. I would never. And last, I feel the need to make clear that I do not think people should belittle the validity of a diagnosis because “that person seems so normal!” or because “we all have stims!” My declaration that we are all a little odd is in NO WAY a negation of autism and aspergers diagnoses. They are real conditions, with real struggles. And just because we all have little quirks does not mean we are all autistic or aspergers. My wish is simply that people would carefully consider their loaded words before tossing them out. EDIT: I also feel the need to add that I DO NOT believe WHATSOEVER that the dramatic increase in prevalence of ASD is due to “better diagnostics” or “more awareness”. I actually find that to be a big crock of…. Well, anyways…. Just thought it was worth noting that although I DO see people flippantly tossing out diagnoses in conversation….I do NOT relate that AT ALL to the real increase in real diagnoses. Those are 2 separate things.